The escape sequence feels a little off both in terms of budget and in the bizarre design and layout of the building whose insanely high ceilings allow for super-easy skulking for Oliver. 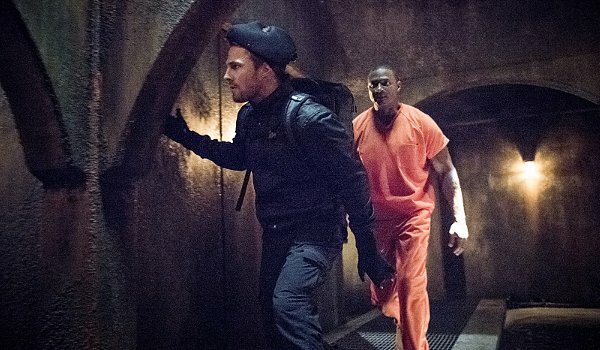 Along with the prison escape and Church's attack on the police, the episode also includes Felicity reaching out to Ragman and bringing him back onboard when the team needs him most as well as more flashbacks to Oliver's time with the Bratva as he continues to earn the criminal organization's trust. The season still has yet to reveal what brought Oliver to Russia or why he is so intent on finding a man that his only recourse is to become part of Bratva just to get close to him. The capture of Wild Dog (Rick Gonzalez) almost certainly foreshadows big problems for both Ollie and his emerald alter-ego. Despite the guy's bluster, I'm expecting Rene to fold like a cheap suit when tortured by Church for information about his team. The weapons from the police impound and inside knowledge about Ollie and his team certainly makes Church a more formidable adversary, but at least Ollie has his trusty sidekick back at his side for whatever might come.